Welcome to Replay Video Capture, the only on-screen video recorder specifically designed for high-speed video capture. With Replay Video Capture, you can turn anything you see on your PC screen into a high quality video file you can play anywhere. Capturing and compressing on-screen video in real time can require a lot of your PC CPU power. Replay Video Capture is specially designed for this task, as it uses special high quality MPEG-2 and WMV codecs that give perfect looking recordings of videos without freezing up your PC. Replay Video Capture 7 cannot be installed on a user account that does not have administrator privileges. The program should only be installed on the administrator account however all clients will automatically get shortcuts if the option “Make shortcuts available to all users” is checked during the installation. Every user has his own recording folder and settings. Only the administrator can uninstall the program. 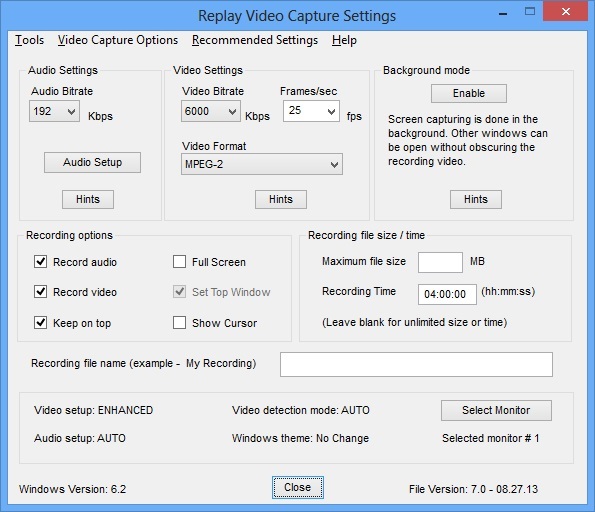 This is a new way of recording video from your computer screen introduced by Replay Video Capture. The recorded video doesn’t need to be visible anymore. In Background mode you can hide the recording window and use the screen for running other programs. You can read your email, write documents or search the web while recoding your video in the background. No other screen capture program offers this groundbreaking feature at the present time. The BCK mode can considerably decrease the CPU loading and such higher frame rates can be achieved when recording large video windows especially high definition (HD) videos. This makes high quality screen recording possible even on slower CPU’s like those used in Microsoft Surface Pro or other Windows tablets. In some cases, it may be necessary to include Replay Video Capture in your anti-virus allowed programs in order to enable the BCK mode. BCK mode limitations: On some Windows 8 computers the BCK mode does not work with Internet Explorer 10. However other web browsers like Chrome and Firefox can be used. The BCK mode may not work with some computer DVD players. Additionally, the window to be captured needs to have a title for RVC to lock onto. 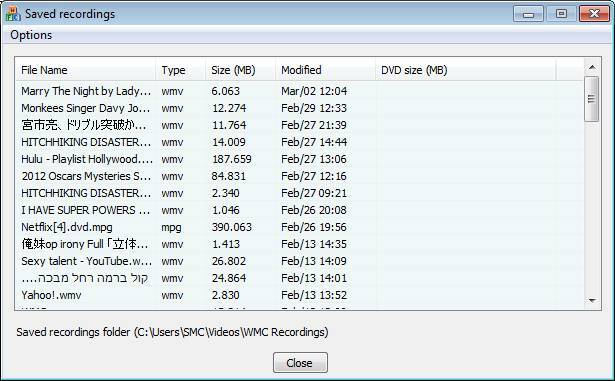 Videos played from Windows Media Player (WMP) may not be recorded since modern versions of WMP do not display information in the title bar of a playing video. 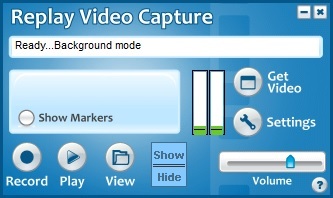 This is another new, unique feature introduced by Replay Video Capture 7. When you enable the Thumb Drive mode you can move the program from one computer to another without the need for another installation. Once you remove the drive there are no traces you’ve done any work on that computer. So if your company does not allow installation of any programs on company’s computers or you want your recording activity to be private you can still capture videos from any computer screen with no hassles and no need for new installations. Click the question mark (Help) on Replay Video Capture window then click Enable Thumb Drive mode. The external drive installation dialog opens. Plug your thumb drive and click DRIVES until your drive name is listed. Then select the drive and click Install. Replay Video Capture installs the folder “REPLAY VIDEO CAPTURE” and the shortcut “REPLAY VIDEO shortcut” on the root of the drive. If your program is registered, the registration code is also installed on the thumb drive. 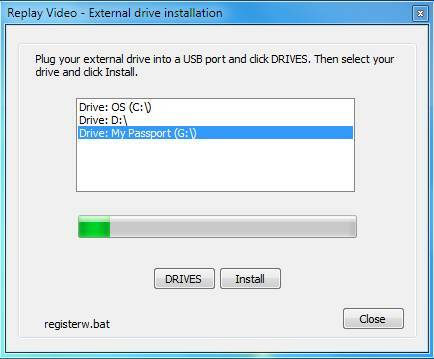 To run the program, plug the thumb drive into any Windows computer USB, and double click the "REPLAY VIDEO shortcut". The recordings are saved in the folder REPLAY VIDEO CAPTURE\RVC Recordings located on your thumb drive. To select preset video recording settings, click Settings, then choose Recommended Settings from the top menu. Choose the selection that most closely matches the type of video you're making. If you're using a dual core computer or better, use the top selection box. If you have a single core computer, use the bottom selection box. Video Format: use MPEG-2 for high motion videos (movies), Windows Media for webinars, documents, full screen/low motion video, small size recorded files, MPEG-4 (MP4) for iPhone, iPad, iPod, Android devices or for YouTube submissions. 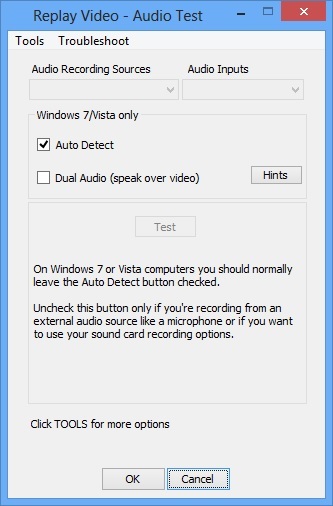 Windows 7 or Vista: Audio recording will be set up automatically. The Auto Detect option will be checked. Just click OK and you're done. Important Note: Make sure your computer audio is NOT setup on Surround or Quadraphonic sound. Replay Video Capture can only record stereo, 44100 or 48000 sample rates. 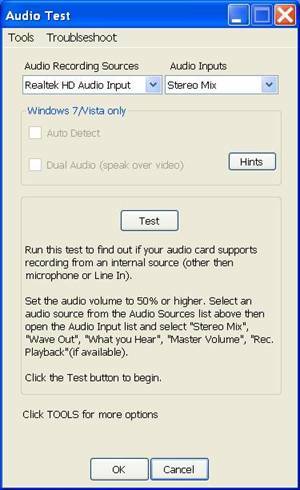 See Troubleshooting instructions if you need to change your audio settings. Replay Video Capture will make its best guess as to what the audio settings should be, but you can override them if you like. If the Audio Sources drop down list shows a source name and Audio Inputs shows an input name like Stereo Mix, Master Volume, Wave Out Mix, What U Hear then click Test to play a sound and ensure you can record audio. Follow the instructions on the screen. After a few seconds, if the test is successful, click OK to save the audio settings. 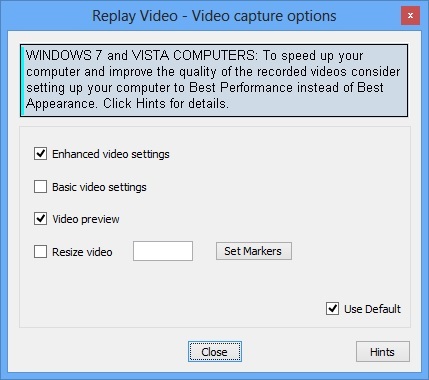 Replay Video Capture 7 changes the Windows 7/Vista theme from Aero to Windows Basic. This greatly improves the general speed of your Windows system by disabling the Aero video effects. The result is a much improved video capture of your screen. The initial theme is restored when Replay Video Capture closes. We highly recommend using this feature. If you want different options, open Settings, Tools, Setup Windows theme. To change between different marking modes click Settings, Tools, Setup video detect mode. Version 7 provides a Manual and an Automatic mode to mark the video recording area. The Manual mode is provided for compatibility with previous versions. The coordinates of the marked window are shown on the main screen (xTop, yTop, xBottom, yBottom (width, height)). 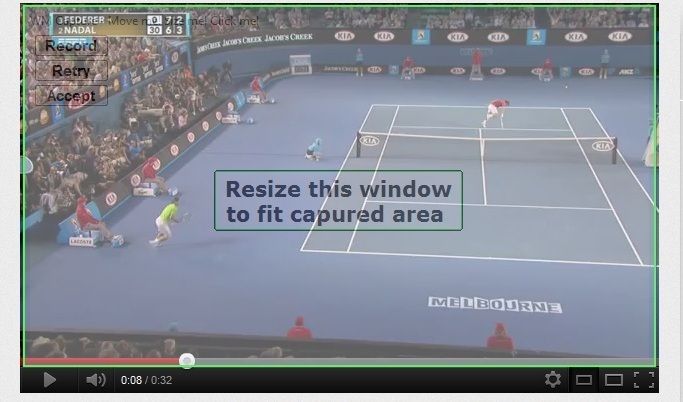 Replay Video Capture can detect motion videos and automatically mark the recording screen area. Begin playing your video then click Get Video. A semi-transparent window marks the video area on your screen. If the marked area is not what you want click Retry to run the detection again or move/resize window to fine tune the marking rectangle. Note: The automatic detection of the video window is done by a motion detection process. Therefore it is important to play the video before using Get Video. Static images cannot be automatically detected. Click Show Markers. A semi-transparent window is shown on the screen. Move and/or resize this window to fit the video area. Click Show Markers. The current position of the markers appears. Note that Replay Video Capture main screen is invisible to recording even if the main screen image overlaps the recording area. To change this, open Settings and uncheck the box Set Top Window. However, this is not recommended when the Auto detection mode is used. If you'd like to pause recording, click the Pause button. Click Restart to resume recording. You can also use Ctrl+F11 to pause and resume recording. High definition video (HD) involves display resolutions of 1,280×720 pixels (720p) or 1,920×1,080 pixels (1080i/1080p). 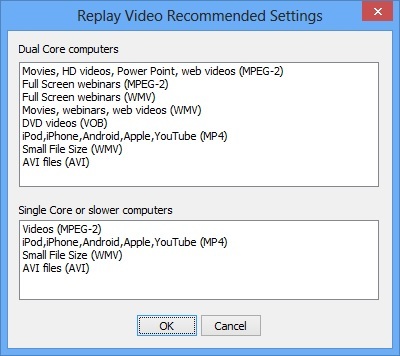 Replay Video Capture can record these resolutions provided that your computer has sufficient speed and memory. Usually a dual core 2.4 GHz / 4G RAM should be able to handle the 720p requirements. Use MPEG-2 video format (not DVD), 6000 kbps video bitrate and 192 kbps audio bitrate. For over one hour recordings expect the file sizes to be in excess of 4 GB. Click the Open storage folder menu option to open a file explorer window for your recorded video files. The volume of recorded file can be adjusted using the Volume slider. When the Stereo Mix type audio source is used, the recording volumes as well as the audio volume of your computer are adjusted. When audio is recorded using the Auto Detect option (available for Vista and Win 7) this slider has no effect on the overall audio volume of your system. The audio is recorded at constant volume even if the computer volume is muted. To increase the performance (speed) of your system and avoid dropping frames consider setting your computer theme to Windows 7 Basic or setting Windows Performance Options to "Best performance" instead of "Best appearance". “Best appearance” is the default Windows setup. Dropped frames are video frames that are skipped during recording because the processor (CPU) is busy performing Vista video effects. To setup the Best Performance Windows mode click Tools on Replay Video Capture Settings then click Windows Best Performance. 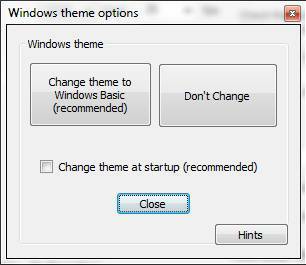 To select or deselect the Windows Basic theme click Tools / Setup Windows theme. Make your selection in the dialog window that pops up. To select the video detection mode click Tools / Setup video detect mode. Make your selection in the dialog window that pops up. The default mode is Auto. Setup Storage Folder: Choose the folder to which you'd like Replay Video Capture to save your recorded files. Setup Video Detect Mode: Determine if you want Replay Video Capture to automatically find video windows, or if you would like to mark them manually. Setup Windows Theme: Determine if you would like Replay Video Capture to automatically change your Windows theme to Windows Basic. Test Filters: Tests available A/V filters. You must run Replay Video Capture as Administrator. 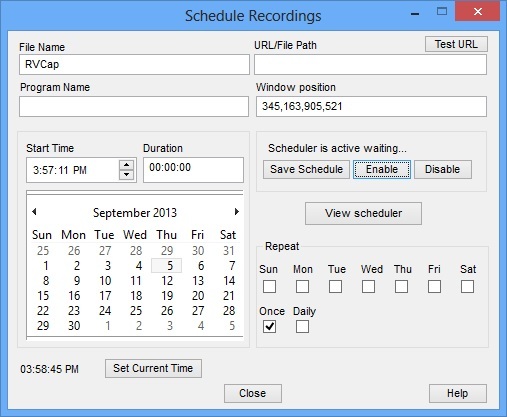 Make Replay Video Capture Visible: Your recordings will include the RVC GUI if it is in the recording area. Show Cursor: Will record your mouse cursor/pointer. Try recording from a smaller video window by resizing your player to 1/4 of your screen, or no more than 640x480 pixels. This won't affect the video quality (since video is scaled UP from smaller sizes to fit a full-screen picture). This will require less computer power to capture, which will make for smoother videos. Replay Video Capture installs an MPEG-2 audio codec capable of playing videos with multiple audio channels. Windows Media Player is the only player we know which can correctly pick this codec when playing back MPEG-2 recordings. Use Replay Video to playback dual audio recordings. If you want to have the two channels mixed in one you should re-record the dual channel video.